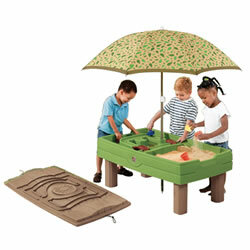 Promote exploration with Kaplan's collection of sand tables, water tables, and their various accessories. 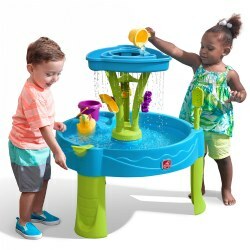 For water toys, products include waterworks play sets, boats, color tints, waterwheels, mini basketball hoop, and squirt toys. For sand play, Kaplan offers diggers, buckets, sifters, and more. 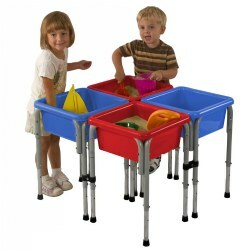 This large sensory table is made of sturdy, weather-proof plastic with a rust-proof chrome steel frame. Features four casters (two locking and two non-locking). 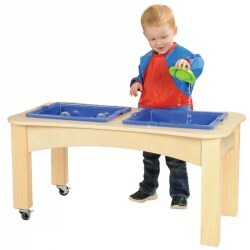 36"L x 24"W x 8"D.
This sensory table includes two 4" deep Mega-Trays that lift out for easy emptying. Also included are two snap-on caddies, and a white plastic lid. No casters. Assembly required. 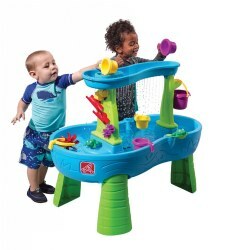 Dimensions: 21"W x 46"L x 18"H.
This tan Toddler Sand and Water Sensory Table is the perfect addition to allow children to get elbow deep in education. 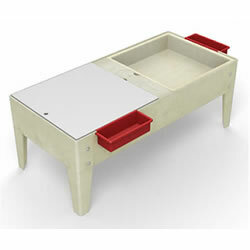 Made with 100% Healthy Kids™ plywood with exclusive Tuff-Gloss™ UV finish. Locking casters on all four legs for maximum mobility. Easy drainage and a no spill gutter wall around the edge of the tub. GREENGUARD® Gold certified. 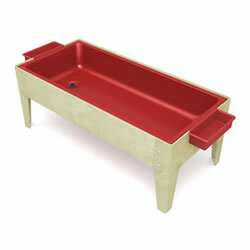 Dimensions: 20"H x 26 1/2"W x 40 1/4"D.
Infants will delight in this tub! 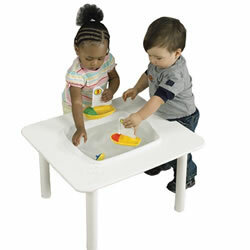 Sturdy plastic construction tub allows for safe and fun experiences, in the water or with sand. 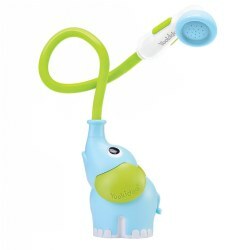 Strong suction cups on the feet ensure worry-free play. 6.5"H x 15"W x 13"D. Tray is 6" deep. 2 years & up. Four to eight children can play at this station at one time. Mix and match sand and water play in each of the four bins. Legs adjust to three heights: 18 1/2" 22" and 24". Complete unit measures approximately 30" square. Includes lids for each bin. Colors may vary. 1 year & up. 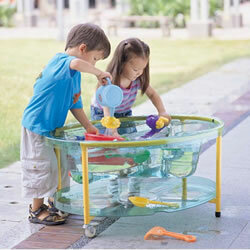 Perfect for sand or water play for toddlers. Table top is made from marine grade material that is completely weather resistant and will not fade from the sun. Remove tub insert to clean. Measures 24"L x 21 1/2"W x 14"H.
12 months & up. 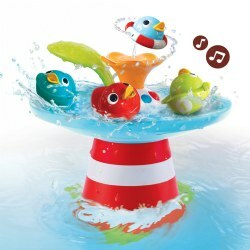 Perfect for indoor or outdoor water play. 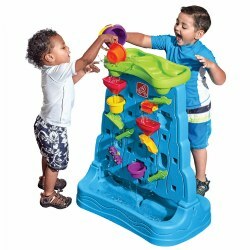 Features a water wheel tower to encourage cause and effect learning, elevated design to keep water at toddler level and will accommodate up to 3 children. Includes 1 cup, 2 sailboats and water wheel tower. Holds up to 4 gallons of water. Measures 27.88"H x 31 1/2"W x 31 1/2"D. From floor to the top of the table is 17". Some assembly required. Made of sturdy, moisture-resistant high impact resins. Great for indoor/outdoor use without worry. 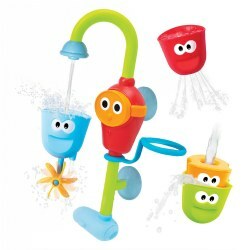 Features a 6" deep full red liner with plug for easy draining. 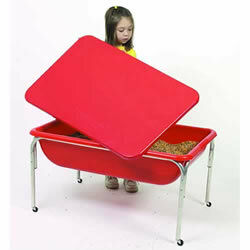 Also includes two snap-on caddies to hold toys, and a lid. 21"W x 46"L x 18"H.
18 months & up. The natural color base and clear tub will fit in any classroom decor. 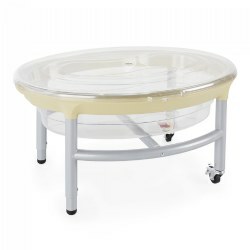 Features a deep clear tub and adjustable legs from 19" to 25". Use Indoors or outdoors. Table has a 5 year warranty. 2 years & up. 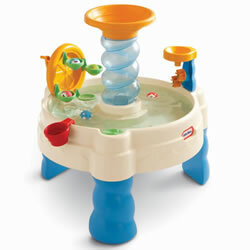 This water activity table will provide children with fun while encouraging development of early motor skills. Features a lazy river, ball drop, ferris wheel, and twin water wheels. 26 1/2"L x 26 1/2"W x 30 1/2" H. Made in the USA. No tub to remove and all one piece construction. 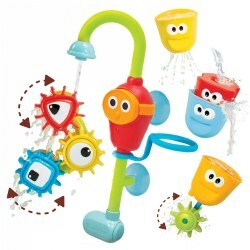 Made of tuff resin, easy to clean and easy to drain. Can be used in or out doors. Comes fully assembled. Includes white plastic lid. 28"L x 21 1/4"W x5"D.